Press credentials for magazines, newsletters, non-daily newspapers, and online publications for the National Political Conventions are handled through the Senate Periodical Press Gallery. All correspondents interested in obtaining credentials should first read and review the rules and regulations of the Periodical Press Gallery. Only one designated person per organization should complete an application. Senate Daily Press Gallery (If you work for a daily print organization). Senate Photographers Gallery (If you are a photographer). House Radio/TV Gallery (If you work for a web page and have significant technical requirements for streaming video and audio). If the Periodical Press Gallery has not received an organization’s application by the deadline, it will not be honored. A Press Pass. Wow. A Press Pass. 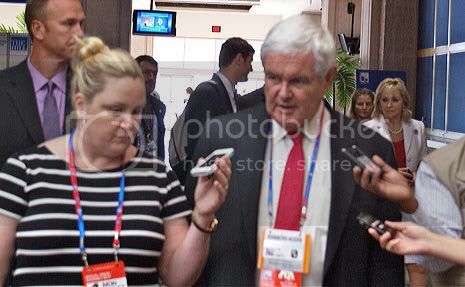 Good ol’ Stacy and good ol’ Newt. Yes! Of Course! What was I thinking? She’d have to have a Press Pass to do that. Did I assume that the professional women of BlogHer would what? Sit across the street at the donut shop to cover the goings-ons at both national party conventions by interviewing passers by? No way. They had Press Passes with entitled status at the National Party Conventions. It’s just that, until I saw that photo of good ol’ Stacy, I was not completely initiated into what BlogHer has in a national presence. An organization begun in 2005 and primarily championed and managed by women has a national presence on the level of the New York Times, The Chicago Tribune and The Washington Post. BlogHer.com can demand and qualify for a Press Pass. That’s a “Wow” with a capital “W.” When I saw Kathryn’s photo of Stacy and Newt, it hit me like a ton of bricks. Wonderful, wonderful bricks. The 2012 Republican National Convention was held in Tampa, Florida during the week of August 27-30, 2012 in which delegates of the Republican Party chose the party’s nominees for President and Vice president for the November 6, 2012, election and, most importantly, BlogHer.com was there! August 30, 2012 Julie Ross Godar Condi Urges Education Reform. Could It Really Create Jobs? The 2012 Democratic National Convention was held in Charlotte, North Carolina,from September 4 to 6, 2012, in which delegates of the Democratic Party chose the party’s nominees for President and Vice Presiden in the November 6, 2012 National Election, and, most importantly, BlogHer.com was there! September 5, 2012 Heather Barmore DNC 2012: Let’s Talk Education, Already! September 6, 2012 Joanne Bamberger Democrats Relocate Tonight’s Big Party: Will It Dampen Enthusiasm? These are just a sample of the articles sent back from the National Party fronts. And, don’t forget that BlogHers Denise Tanton and Rita Arens acted as Home Support coordinating efforts to give the teams in the field what they needed to finish the job. And it is so easy to point with pride at the women with Press Passes that now cover the news. I’m glad we’re to the point where it’s often taken for granted.